Melee version download is unprotected. - 골드러시는 19세기 중반에 금이 발견된 미국 서부 지역으로 사람들이 대거 모여든 현상을 지칭하는 말이다. 안전하게 지킬 수 있는 멀티가 외곽에 분포해있기 때문에 단순 힘싸움 외에 자원을 차지하기 위한 게릴라 전투를 함께 볼 수 있는 맵이다. 자원지역을 둘러싸고 벌어지는 전투 양상과 맵의 전체적인 타일셋을 바탕으로 골드러시라는 이름이 붙여졌다. 맵 외곽지역에 있는 특수한 "관문"을 얼마나 잘 이용하느냐에 따라 승패가 결정될 수 있는 컨셉맵이다. - 다른 스타팅으로 갈 수 있는 외곽 루트가 양옆으로 존재하며, 2단계의 관문으로 막혀있다. 각 관문은 중립어시밀레이터 2개 및 중립에그 2개로 막혀있는데, 이는 트로이와 플라즈마의 맵 컨셉을 결합한 장치이다. 최초 상태에는 미네랄 클릭을 통해 일꾼만 이동할 수 있지만, 에그 2개를 파괴하면 모든 유닛이 지나갈 수 있고, 중립 어시밀레이터를 파괴하면 유닛이 이동할 수 없게 막히게 된다. 상황에 맞게 관문을 열지 닫을지 전략적으로 판단하는 것이 중요한 맵이다. - 제2 가스 멀티는 외곽지역과 센터지역에 각각 3곳씩 분포해있다. 각 멀티는 다른 지역에서 포격할 수 없다. - 본진은 서플라이디포 2개와 배럭 1개로 막을 수 있으며, 입구에 서플라이와 배럭 심시티 위치가 표시되어 있다. - 앞마당에는 심시티를 돕는 중립에그 1개가 놓여있다. - 관문 옆에 놓인 미네랄양은 24이며, 관문 바로 옆은 건물을 지을 수 없는 타일로 이루어져 있다. - 중립어시밀레이터 간격은 트로이 맵과 같다. 어시밀레이터 한 개가 파괴되면 대형 유닛(시즈탱크, 드라군, 럴커 등)은 이동할 수 없다. 어시밀레이터가 두 개 모두 파괴돼도 고스트는 통과할 수 있다. 중립어시밀레이터가 파괴되면 그 자리에 다시 가스채취 건물을 지을 수 없다. - 맵 특성상 유닛 이동 명령 시 정찰 버그가 발생할 수 있다. 의도치 않게 외곽으로 유닛들이 이동할 수 있으니 게임 플레이 시 주의를 기울여야 한다. - The Gold Rush refers to the phenomenon of people gathering in the western United States where gold was discovered in the mid-19th century. Because it is distributed on the outskirts of a multi-capable safeguard, it is a map that can see a guerrilla battle to occupy resources besides a simple power fight. The gold rush was named based on the battle aspect surrounding the resource area and the overall tileset of the map. It is a concept map that can determine the win or loss depending on how well you use a special "gate" in the outskirts of the map. - There is an outer route on both sides that can lead to other starting, and it is blocked by a two-stage gate. Each gate is blocked with two neutral aspirators and two in neutral, a device that combines the concept of a map of Troy with a plasma. In the initial state, you can only move a miner through miner clicks, but destroying two eggs can pass all units, and destroying a neutral aspirator will block the unit from moving. It is important to strategically determine whether to open or close the gateway to suit the situation. - The second gas multi is distributed in the outer area and the center area respectively. Each Multi can not be bombarded in any other area. - The main unit can be blocked with two supply depots and one barrel, and the entrance and supply positions of SimCity are indicated. - In the front yard there is one in neutral to help SimCity. - The amount of minerals placed next to the gate is 24, and the side of the gate is made of tiles that can not be built. - The neutral aspirator interval is the same as the Trojan map. Large units (Siege Tank, Drago, Lurker, etc.) can not move when one of the aspirators is destroyed. Even if both of them are destroyed, ghosts can pass. Once the neutral asymmetry is destroyed, you can not build a gas extraction building back in place. 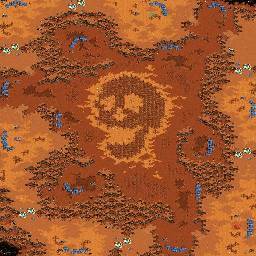 - Due to the nature of the map, a reconnaissance bug can occur when the unit moves. Unintentional movements of units may be inevitable, so be careful when playing games. The inverted ramps on this map are a mess. Look at the path regions on the one on the right lol. Edit: Actually is there a possibility of a vortex on that one? Could only be a vortex for Ultras, not sure. Hard to stack Ultras to begin with. I have not tested cases like this so far. What exactly are these maps? Have you been asked to upload them here or have you found them by chance? I guess you should send a link to this thread to the feedback e-mail address specified in the description. Your supposed Naver links link to (3)Blackout instead. Otherwise the map seems pretty well-made. Unfortunately, however, the first association it invokes for me is (3)Central Plains which does not forbode the best for balance and interesting games. I would restructure it significantly. Get rid of the natural backdoor in its current form, maybe add a more (3)Hazard-Black-like one instead. Keep the Assimilator gate for the main backdoor, but open up the other entrance to the rest of the map and create a possibility for it to be opened up later in the game, so the shortcut to the main can be strategically interrupted, but the other entrance cannot just be sealed to make it a safe island. Overall I'd rather have all the gas expansions around the perimeter and a wider, more interesting middle. The long distances along the perimeter paths probably don't make much of a difference, especially given that the expansion are going to degenerate into island bases eventually anyway. The huge size and long distances only make Recalls even more of an issue, just like on Central Plains. Nah nobody asked me lol. They are the new ASL maps starting in the Ro24 i think. They are on 910's Naver blog, but I was made aware of this map and the new Crossing Field through Teamliquid. I will have to fix the links then, I was copy/pasting a bunch of stuff and I guess some of it got mixed up. Also the pros have started playing on these maps, you can go to Jaedong's YouTube page and he has some games there vs Best and Mind so far. 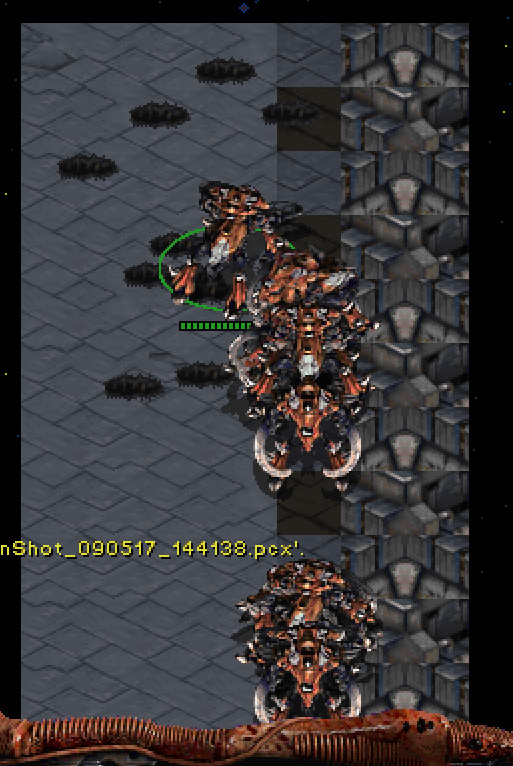 I posted on TL that I felt Tvz would be difficult as the Terran has no way of stopping a quick third gas. In Jaedong's game vs Mind he literally goes for a third gas right after his pool. So 3 as before pool is done, and Mind has no real way of shutting him down unless he probably went for a 2rax build or a quick 2nd rax after cc. So they make a public map contest and then pull this questionable, untested thing out of thin air?! So now they have a map pack around two new maps, both of which heavily focus on super-safe backdoor bases? Looks like a very questionable idea to me. Region intersections like this (can also be zig-zag like region borders) are generally by far the most common cause of mining bugs I could identify, though there are a few others caused by workers having to traverse multiple regions on their trips or mineral patches being in a different region than the worker while mining. Fixed the ramps and gas mining. I also sent the link to the feedback address given in the map description. Let's hope it seeps through to the Afreeca officials before the tournament starts. Maybe you can send the link directly to 910? 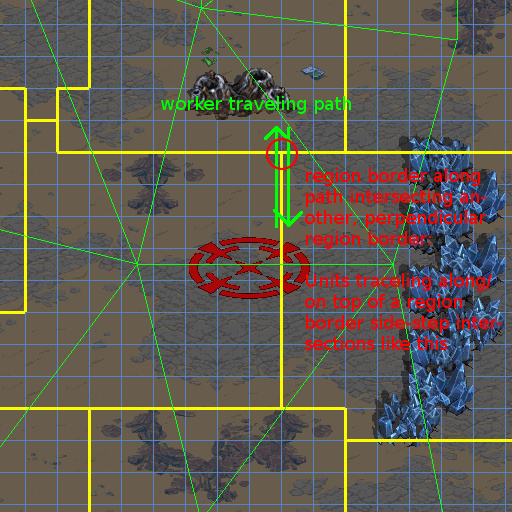 If there are unwalkable subtiles directly adjacent to a node tile at the left or right, Ultralisks can get stuck on there. The principle is the same as with all stuck stack bugs: The unit's collision box overlapping unwalkable ground causes the pathfinding engine to continuously force command the unit to walk towards the node of the region its on to get it unstuck. But since the unit is already sitting right on the region node, it cannot move anywhere any more. Because Ultras are the only Units with a collision box bigger than a tile, they are the only Units that can actually get stuck on non-node tiles which have unwlkable subtiles right next on the side to a node tile. Oh, and in case you haven't figured it out yourselves yet: Painting shapes with different level terrain types is an easy way to free-form pathfinding regions and test specific constellation in-game. Updated Picture to 0.96 version. Melee download is now unprotected 0.96 version as well. Just a quick look: Freakling's attempts at fixing the ramps was not incorporated. No idea if the the new pathfinding regions make for better or worse resource collection. Last time I sent my bugfix to the feedback address given in the map description. I guess that belongs to the map maker. If it were run by Afreeca, Crossing Fields would have one too. So this time I contacted 910 directly, sending him links to the newest bugfixed versions of this, Crossing Fields, Tau Cross and FS. - Fixed entrance entrance to the front hill at 1 o'clock. - Move the 1 o'clock forearm to the wall and modify the surrounding terrain. Fixed a bug that prevented the left asymilm from attacking with a river castle at 6 o'clock. -Open the current map picture next to the map download in another tab. -Open another tab for the 0.96 picture above in this thread. -Now you can switch between tabs to compare the different versions. Melee version and map picture updated to version 1.1. I saw a version 1.0, and if it's the same as the official Gold Rush, then they've *finally* fixed the ramps for the most part. One thing to keep in mind is that any past fixes involving pathfinding can potentially be undone if terrain is altered during a version change. 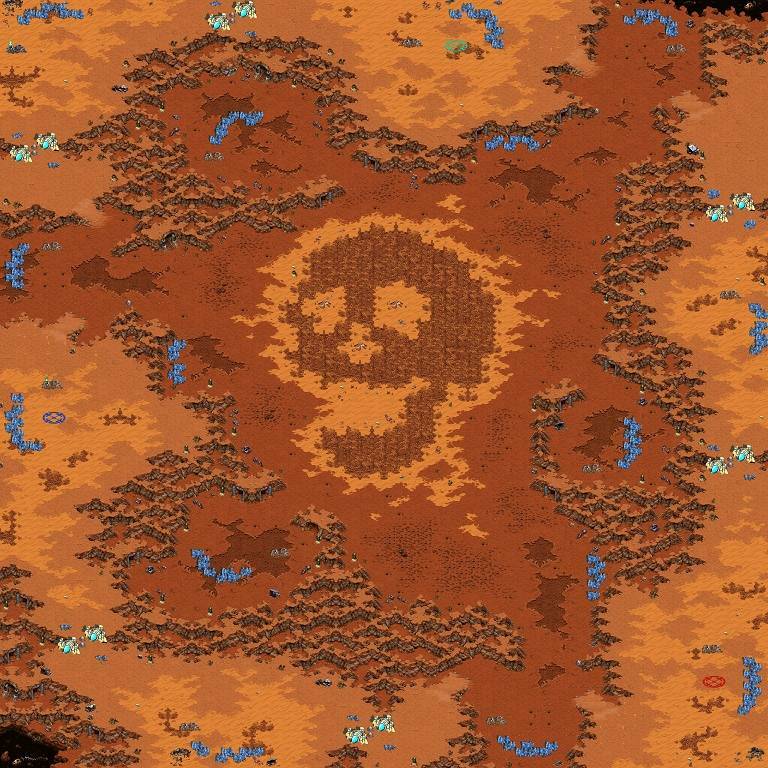 Mining in 1.0 was pretty good, better than any old Kespa maps. The bad initial ramps suggest that the map maker may not have been using ScmDraft 2.0.9.0 as yet, so pathfinding regions would be off his radar too. The ramp updates seem to be derived from the ones I did and sent to him and 910 (actually, I just realized I got a special thanks in the map credits :D). "Fixed a bug that prevented the left Assimilator from being attacked with a Reaver Scarab at 6 o'clock." The probably cause was that the tile under the Assimilator centre was unwalkable and hence the whole Assimilator conidered placed on unwalkable ground. Since a Scarab is a unit that follows ground pathfinding, the engine than decided that a Scarab could not reach the Assimilator and therefore would not attack. This change caused no other pathfinding changes. Crossing Field 1.33 → 1.34 update is an example of a very small terrain fix introducing a serious bug. The terrain fix was making one tile unwalkable to block the whole behind the mineral line at 7 o'clock, the effect was the shifting of some pathfinding regions, including the shifting of the region node of the ramp at the bottom left back onto an partially unwalkable tile. Oh that's cool they gave you some credit! I thought they wouldn't listen at all lol. 910 definitely forwarded my e-mail. I had a very long exchange with Waldstein wherein I detailed all the intricacies about pathfinding regions and vortex bugs. His English is good and he also told me he'd write An article to spread the knowledge in the Korean community. I completely agree lol. Something needs to happen so that they finally start paying attention to these bugs and respect the work that map makers put in to make great quality maps. I hope Waldstein gets that article written and the information passed on to the korean map making community. They really need it, and it could potentially have a profound effect in that they might have somebody look for these bugs before tournaments and raise the quality of the maps used in leagues in general. Yeah, Gold Rush 1.1 looks like it should have relatively few mining bugs, as Waldenstein seems to have been able to fit all of the mineral patches and the start location into a single pathfinding region.